LifeNets is exporting the success of the ten-year old experience in Zambia to Kenya and Zimbabwe. Leaders from both those countries travelled to Zambia in April 2010 to learn about how we have helped communities achieve food security and a higher standard of living. 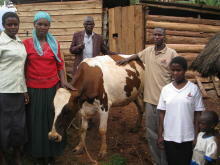 Merrie and just returned from Kenya where we visited the first recipients of the LifeNets Heifer Project. The program is off to a great start and all involved are doing commendable jobs in selecting and caring for these important animals. 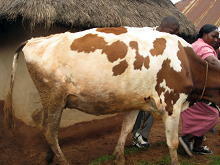 Attached is the September report from the Heifer Project director, Moses Nyaira, along with photos. It is now three months down the line since LifeNets funds were remitted to us It is therefore important to give a feedback on the progress so far. One of the things that we learned when we were in Zambia was that LifeNets has to be run legally. In this regard, I am happy to report that we have had LifeNets East Africa registered with the Registrar of Societies as a non-governmental organization (NGO). From Ogembo the project will spread to families in other areas in western Kenya and northwest Tanzania. To start with we resolved that the beneficiaries should construct zero grazing units (cow sheds) at their own expense. This demonstrates an investment initiative on the owner’s part and provides shelter insuring that the animal’s health is not compromised. That is their contribution to the project and therefore shows that the beneficiary will be committed. The zero grazing units are relatively expensive to construct and that is why we feel that the beneficiaries of the heifer will be serious about the project having spent their money and effort to the project. . The five selected recipients have now completed the construction of their zero grazing units and the cattle are being purchased and distributed to them. 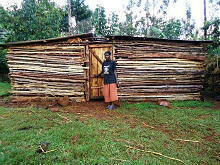 The first to complete the construction of the zero grazing units (cow barns) was Lawrence Ndege Ontita. Lawrence and his wife Marcilene have six children three sons and three daughters. This is a hard working family. Five of their children are schooling. The family live in a small house on their small farm. Their heifer is already providing 4 litres of milk per milking. The family is happy and appreciates this greatly. 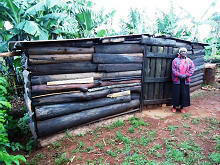 The second family to complete the construction and receive their heifer is that of Mr and Mrs. Wilfred Motondi Nyameri. The family has 5 children including two sons and three girls, two of which are married. This is the second family to receive a heifer. Their heifer is also of the Ayrshire breed and is providing a lot of milk. They propose to breed it as soon as they can reduce the milk supply to avoid causing mastitis. The third family to complete the construction of the zero grazing unit is that of Joyce B Nyabuto but has not yet received a heifer. Joyce Nyabuto is married with five children, all girls. She Is a hard working lady. 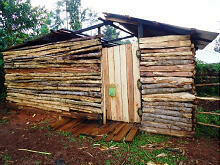 The fourth family to complete the construction of a zero grazing unit is that of Kriphas Henry Ongori. 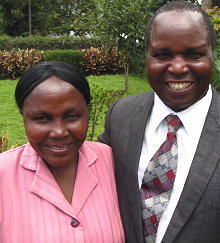 Kriphas Ongori is married and has two children, a girl and a boy. His wife, Naomi is a hard working lady who loves her family. The 5th family to complete the construction of the Zero grazing unit is that of Mr and Mrs Timothy Oriango who have 4 children, 2 girls and 2 boys. Nyameri family with their Ayrshire heifer cow. The families who have already received the heifers are already feeling very blessed and happy. They have continued enjoying milk for food from the heifers, and they have excess milk to sell and pay for their basic needs including sugar, salt, cooking fat, oil, paraffin, and school supplies for their children. The cow dung is also being used to fertilize their garden plots. Therefore there are still many more who need to receive heifers in order to improve the standard of their living in these ways. When we obtained the first two heifers which we have already distributed, the funds had not yet arrived. So, for the first one we had to borrow the funds from a church since the demand for these quality heifers was very high and the owner could not wait for us. The other heifer was given in advance of payment with the understanding that we would pay him when the funds arrived. The second challenge is that of farm implements like a wheel barrow, clean drinking water for the animal, and transport. The water level in Ogembo is very deep and it is therefore note possible to hand dig meaningful water well. Because of this I therefore suggest that the first five members be assist with a Ken-Tank plastic cistern which are relatively cheap when compared with drilling a bore hole (shallow well). One 12,000 litre water tank costs about $300USD. Adequate rainfall in the area is available, and storage tanks will help the owner store rain water for the animal and this will ensure the availability of clean drinking water for it. The first two heifers cost us Ksh. 50,000 ($676 USD). We are searching for similar animals at similar prices to be purchased with the remaining funds. We propose that when funds are available this project can likewise spread to other communities where vegetation and rainfall is viable. In that way we can have a great impact on improving the standard of living of other families in this region. We sincerely appreciate your support and look forward to the second phase with a great deal of excitement.